Dr. Johnson, Dr. Farris, Dr. Brand and Dr. Harper at Professional Eyecare – Your Eye Doctors in Kansas City and Overland Park. Our office provides the latest technology in the services we offer our patients. We take pride in the quality of care our patients receive in all areas. Our optometrists, Dr. Wes Johnson and Dr. Katherine Mohr at Professional Eyecare look forward to making your next eye exam a pleasant experience. Our optometry clinics in Kansas City and Overland Park also provide eye care for the nearby area of Shawnee Mission. Your eye doctor should be someone you can trust and rely on for expert opinion. At Professional Eyecare, your eye care is our number one priority. 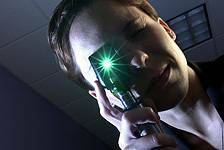 We strongly encourage everyone to get a comprehensive eye exam once a year. Even if you do not have vision problems, a vision “check-up” can be critical in spotting and treating issues before they affect your vision.